This smooth break action pistol comes with a cocking aid, so you can have the power of a heavy duty piston, without the struggle of cocking it. The Nitro Piston 2 technology functions perfectly, no matter the temperature or conditions and gives consistent power, shot after shot. With adjustable sights and an angled textured grip, you'll love the way you feel looking down the sights of this airgun. The front and rear sights are both fibre optic to aid accuracy in low light and the rear sight is fully adjustable for both windage and elevation. 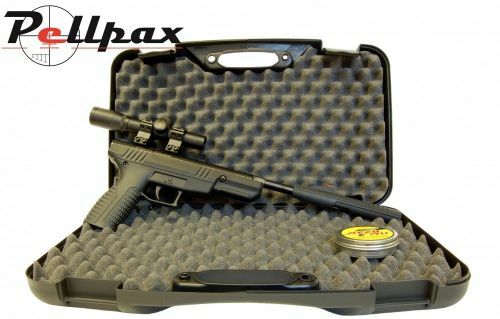 We are now doing this as a combo kit featuring the pistol, 2x20 Pistol Scope with mounts, Plastic Hard Case to keep it all secure, and a tin of .177 Pellets. Everything you need to get going.